NEW YORK, January 15, 2019 – New data released today found that compliance requirements inhibit further cloud adoption and cause confusion for IT decision makers in North America. The survey findings from Wakefield Research and Logicworks, an Amazon Web Services (AWS) Premier Consulting and Azure Gold Expert MSP Partner, confirm that companies are struggling to meet compliance requirements in the cloud and desire greater expertise and automation to tackle cloud compliance challenges. 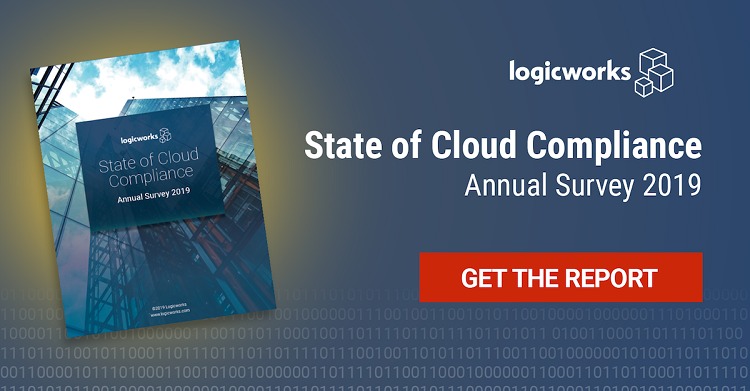 Most striking from the report was that 88 percent of the 400 surveyed IT decision makers at mid- to large-sized companies agree that having to meet compliance standards in the cloud inhibits further cloud adoption within their company. Among senior management — those most close to and responsible for cloud execution and performance — 97 percent agree that compliance inhibits cloud adoption, compared to 81 percent of executives. Even as cloud adoption increases across companies of all sizes, 77 percent of IT decision makers believe that they would not pass all of their compliance audits for cloud resources. This problem is compounded by a lack of compliance automation, difficulty finding workers skilled in cloud compliance, and ever-changing regulations. Logicworks helps companies in highly-regulated industries to achieve compliance in Amazon Web Services, Microsoft Azure, and Private Cloud. While the companies that work with Logicworks often understand their regulatory requirements, they struggle to translate regulations into a specific set of configurations and need assistance in operating and automating HIPAA, PCI-DSS, HITRUST CSF, SOC1, and SOC2 workloads on the cloud. Remaining in regulatory compliance is mission-critical for many companies in highly-regulated industries such as healthcare and financial services. However, companies report a high degree of uncertainty around cloud compliance. ● 77 percent of IT decision makers don’t think their cloud environments would pass compliance audits if they occurred today. ● Companies in healthcare and media reported the highest degree of uncertainty; 92 percent of IT decision makers in both industries don’t think their cloud environments would pass compliance audits if they occurred today. Companies are concerned that changes in regulations will affect their company. Combined with lack of expertise, this contributes to the uncertainty around cloud compliance. ● 69 percent of IT decision makers believe compliance regulations will change in the next year. ● A third (33 percent) of IT decision makers believe regulation changes in the next year will increase cloud-related costs at their company. ● 51 percent of IT decision makers believe it’s easier to find a unicorn than an engineer with compliance expertise. The vast majority of IT decision makers want more compliance automation than they currently have. Automating compliance tasks will positively impact both confidence that resources are compliance and pave the way for increased cloud adoption. ● Companies are currently automating an average of 27 percent of cloud compliance tasks but have a goal of about 65 percent automated. ● 82 percent of ITDMs want more automation in their cloud compliance tasks than what they currently have. The Logicworks Survey was conducted by Wakefield Research (www.wakefieldresearch.com) among 400 ITDMs at mid and large-sized companies, between December 2-11, 2018, using an email invitation and an online survey. Logicworks, the leader in compliant cloud solutions, provides end-to-end cloud strategy, operations, security services to clients in the finance, healthcare, and SaaS industries. Logicworks is an AWS Premier Consulting Partner and Microsoft Gold Certified Partner, and one of the only cloud partners in the world to have achieved HIPAA, HITRUST CSF, PCI-DSS Level 1, SOC1 and SOC2 certification. Our customers include MassMutual, Pitney Bowes, Orion Health, and other top companies that demand the highest standards of agility and governance.